Silliman University President Dr. Betty C. McCann dons a doctoral hood on Prof. Garry Ronald Russ during the conferral of his Doctor of Science degree, honoris causa, at the Claire Isabel McGill Luce Auditorium, November 16. Prof. Garry Ronald Russ, Chief Investigator of the Australian Research Council (ARC) Centre of Excellence in Coral Reef Studies at James Cook University (JCU), has been conferred a Doctor of Science degree honoris causa by Silliman University (SU) in ceremonies held at the Claire Isabel McGill Luce Auditorium, November 16. 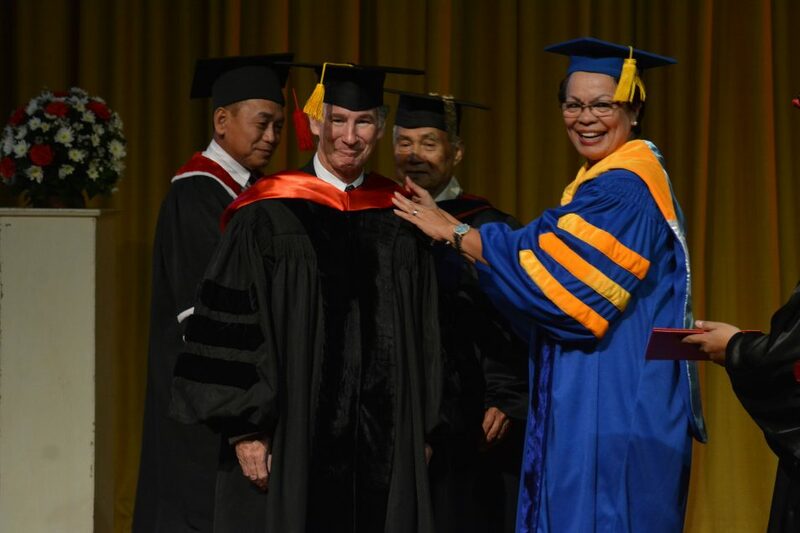 SU Board of Trustees chair Ricardo A. Balbido, Jr., SU president Betty Cernol-McCann and former Commission on Higher Education chair Dr. Angel C. Alcala, conferred the honorary degree on Prof. Russ for his outstanding international accomplishments as a marine scientist and for his contribution toward shaping Philippine policy on No-Take Marine Reserves (NTMRs) and local marine resource management. Prof. Russ is an internationally recognized marine scientist and scholar known for his research program on coral reefs, reef fishes, and fisheries from the Great Barrier Reef in Australia to reef fishes and coral reefs in the Philippines. He has a record 14,031 career Google Scholar citations and was ranked no. 18 in the world in citations out of 5,060 coral reef ecologists, according to a 2004 survey by ISI Essential Science Indicators. The Australian professor has contributed immensely to the research program on NTMRs of Silliman University in the last 37 years. Working with National Scientist Dr. Angel C. Alcala of SU, he initiated the methodical underwater surveys on SCUBA at the first NTMR ever established in the Philippines on Sumilon Island and at another NTMR on Apo Island. The research he led helped establish NTMRs as a legitimate, community-based approach to managing marine resources in the Philippines. The surveys he conducted almost every year since 1983 resulted in one of the longest ecological time-series data sets for coral reef ecosystems in the world. Using these data, Prof. Russ, Dr. Alcala, their colleagues, and graduate students at SU and JCU co-authored 30 publications. Citations of these publications make up 41 percent of the total ISI citations of SU. Prof. Russ received a Pew Fellowship in Marine Conservation, together with Dr. Alcala, in 1999. The Pew Marine Fellowship is one of the most prestigious awards in the world for marine conservation. As an author, Prof. Russ has published a total of 171 publications: articles in international refereed journals, book chapters, conference papers, articles in Australian refereed journals, and refereed reports.